I had a discussion recently with a Christian friend about belief. For me, pondering the process of believing is far more interesting than the content of any belief, so you won’t find me debating the existence of God. Instead, I’d wonder why people believe in God. Clearly, we emotionally need to trust the veracity of our words before we can formulate a belief in any thing. Words and names are the building blocks of belief. We must believe they are real before we can weave them into intricate fabrics of belief. Indeed, we must trust word meaning ‘religiously’, unquestioningly, blindly, to believe truly what we think. Words and names are like pillars of preconception from which we build and maintain the temples of our beliefs. Even writing these observations now requires an underlying belief in the meanings of the words I’m using to express these observations. 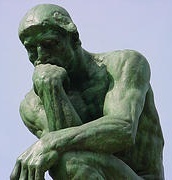 I must believe in word meaning at least provisionally in order to think about thinking. Debating the quality of a particular belief is like debating the quality of any product. Unless you test the quality of the materials used to build the product, you can never know the true quality of the product. For example, we use concrete to build bridges. You must inspect the integrity of concrete itself to know the true integrity of the bridge. Otherwise, it remains simply an aesthetic issue: Do we ‘like’ the bridge? Is the bridge ‘beautiful’? Do you ‘believe’ in the bridge? Like concrete for bridges, words are the material we use to build the beliefs we think, so let’s poke around, and see what turns up. Word meaning is the basis upon which we learn, preserve, and pass on our culture’s worldview (religious or otherwise), yet we seldom inspect the integrity of this foundation (1). Why do we so readily accept word meaning on faith? Obviously, we learn this framework from infancy onward. Our upbringing and cultural conditioning never offers us another way to experience awareness. Word meaning becomes a self-reinforcing ‘virtual reality’. Belief in the words we use to think leads to believing what we think, and vice versa. It is a self-fulfilling prophecy, so to speak! It is clear that emotion plays a huge role in word meaning. A baby, before it learns the ‘correct word’ to express emotion, expresses emotion in babbling and crying. As a baby learns word meaning, it uses words to begin expressing its feelings. As we mature into adults, word meaning becomes second nature; it is a closed loop where feelings evoke words which re-evoke feelings. Our primal sensory and emotional experience – feeling – causes the blind faith we place in word meaning. Consider the basic emotions common to all animals, especially those with more developed nervous systems. Word meaning emerges from such primary emotion. The illustration below depicts this. Consider the primal emotions common to all animals — need and attraction versus fear and aversion. 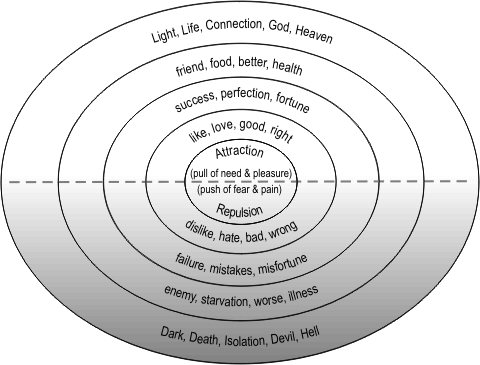 Attraction and aversion are the threads that tie all living things together. The push – pull dynamics of this play out at all scales of life, from amoeba to people. Need for something (pleasure) pushes us forward. Fear of something (pain) pulls us back. Pleasure attracts; pain repels. That mechanism makes survival possible for all living things. In nature, feeling need and pleasure indicate a survival advantage; feeling fear and pain indicate a danger to survival. Many animals express attraction and repulsion with vocalizations. Humans are the only animals we know who have honed such vocalizations into extensive cognitive vocabularies — names and words. If something stimulates a sense of pleasure, I’ll be attracted to it. In this, a duck and I are no different. However, when I think or say, “I love that, it is good, it’s beautiful, it’s right, and I want more of that”, I’ve transformed the raw sensation of attraction into words symbolic of that experience. The same applies to repulsion; feelings of repulsion and fear become linked to words: “I hate that, it’s bad, it’s ugly, it’s wrong, and I want to avoid that.” Unlike the duck, I am dealing with two experiences: an immediate sensory one plus a virtual cognitive one that I can dwell on for years. Naturally, life seldom feels like a simple choice between what we are attracted to and repelled from. Often we are torn between the two. For example, “I love the Sun vs. I hate to get sunburned”; “I love meat vs. I hate the way they treat animals”; “I love cake vs. I hate being overweight.” As a result, we can spend much of our waking moments in a kind of tug-or-war between varying degrees of stressful worry. Imagination pulls and pushes us. We long for a future and regret a past, or we long for a past and fear a future. We want to have our cake and eat it too. The power of thought comes with unintended consequences. Chapter 71 sums it up, To know yet to think that one does not know is best; Not to know yet to think that one knows will lead to difficulty. The “difficulty” arises from inferring too much reality in what are merely figments of our imagination. In other words, unmet expectations arising from imagined needs and fears produce stress. (1) LSD and similar chemicals can shake the foundation of meaning temporarily, but this always comes with more adverse and unintended consequences than it is worth.